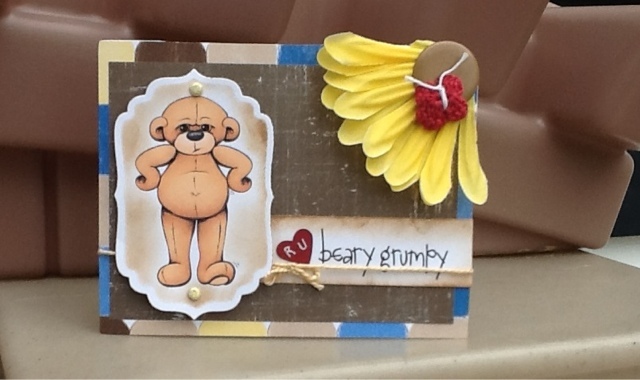 Scrapshack Anyone: R U Beary Grumpy? This little grumpy Gus comes from Beccy's Place. I used an image that was already coloured for those who just love the creative process without the need to scribble or blending colors. I used an A2 size card, also known as an A-Frame card. If you need a tutorial on various types of cards that you can create please go to: http://beccysplace.blogspot.com.au/. I used scraps that were needing me use them up! I believe the patterned paper is Close to My Heart. The flower came from the dollar store...you know the big flowers you can buy...well take those home, tear them apart and Voila- instant flowers to alter, play with or just use. I used Distress Ink around a Spellbinder die to get that framed in look. That cute crocheted butterfly came from a friend! Her sister creates those cuties (although I hear she may not have as much time on her hands as she is having a beautiful bundle of love- CONGRATS). When I use this card I hope it brightens someone's day....even though everyone has those kinda days! Happy Scrappin folks! Here's to a beautiful sunshiny day!